You study the Bible to connect with God's heart. The NLT Study Bible gives you the tools you need to enter the world of the Bible so you can do just that. Including over 25,000 study notes plus profiles, charts, maps, timelines, book and section introductions, and approximately 300 theme notes, the NLT Study Bible will make your study personal and your devotions serious. NLT Study Large Print Bible: Pink/Brown, Imitation Leather by New Living Trans 2 was published by Tyndale in December 2014 and is our 11087th best seller. The ISBN for NLT Study Large Print Bible: Pink/Brown, Imitation Leather is 9781414395661. 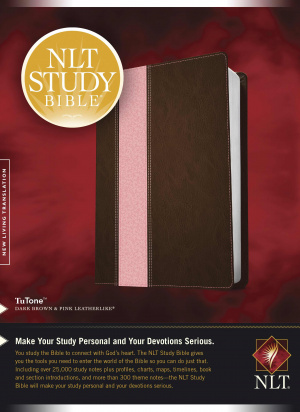 Be the first to review NLT Study Large Print Bible: Pink/Brown, Imitation Leather! Got a question? No problem! Just click here to ask us about NLT Study Large Print Bible: Pink/Brown, Imitation Leather.